DUMBARTON made it through to the last eight of the Irn Bru Cup with a Friday night third round victory over League One side Stranraer. 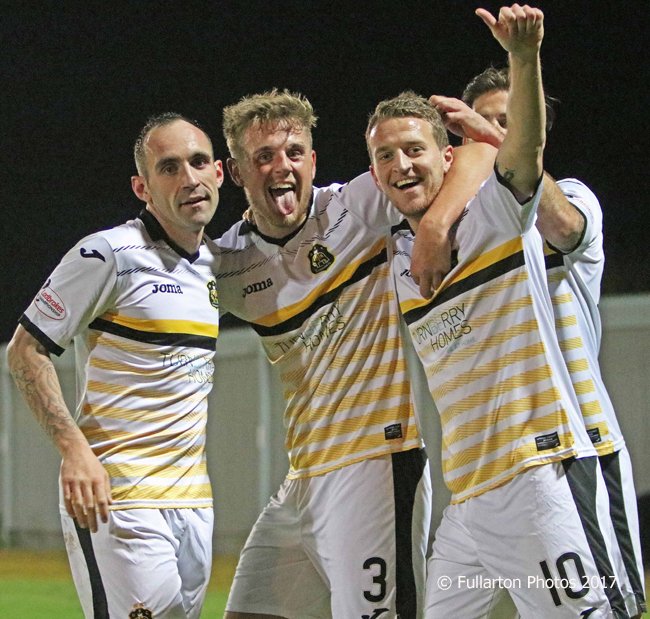 DUMBARTON made it through to the last eight of the Irn Bru Cup with a Friday night third round victory over League One side Stranraer in front of a 496 crowd. Manager Stevie Aitken's men had their first victory over Stranraer — managed by Stevie's former assistant Stephen Farrell, with Steve's brother Chris as his assistant — since 2003, and it followed five successive defeats in cup ties. After getting the better of the opening exchanges and missing a couple of chances, Sons opened their account on 13 minutes with a well taken low drive by Craig Barr from a David Wilson cross. On 32 minutes home keeper Scott Gallacher had to be replaced by Jamie Ewings, unable to shake off an injury suffered 10 minutes beforehand. Stranraer showed determination in the midfield battle for much of the half, but Dumbarton looked dangerous on the break. The visitors continued their pressure after the break, keeping the ball in Sons' half for long periods. Then, on 65 minutes, and against the run of play, Dumbarton stole a second goal. A great cross from Tom Walsh picked out Mark Stewart, who headed confidently home. It was millimetres from being three for Sons on 80 minutes, but somehow Stranraer managed to clear Dimitrios Froxylias' side-footed shot off the line. In the third minute of time added on Stranraer pulled a headed consolation goal back from substitute Stephen Okah.